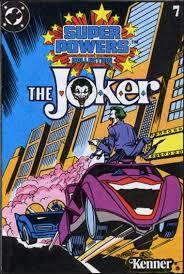 Ah the Jokermobile... Kenner produced a concept for a Jokermobile for the Super Powers Collection and it even showed up in a couple of the mini-comics, but it was never produced. The concept drawings can be seen over at The Super Powers Hall of Justice Website. This would have been a really cool toy, but alas, as far as we know it never made it past conceptual drawings and no prototype was ever produced. 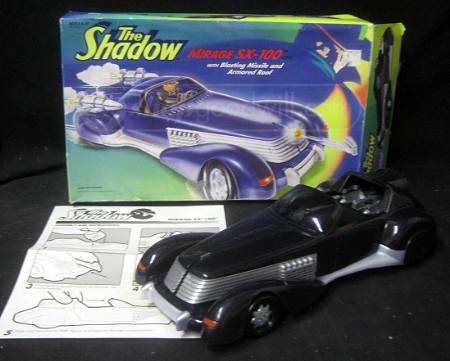 A fellow collector, Wes Ferguson, has come up with this simple recipe for a Jokermobile -- Base car: Kenner Shadow Mirage SX-100, giant Joker head hood ornament: Kenner Dark Knight Collection Joker Cycle. Optionally, the seat from a G.I Joe Locust Copter may be added. 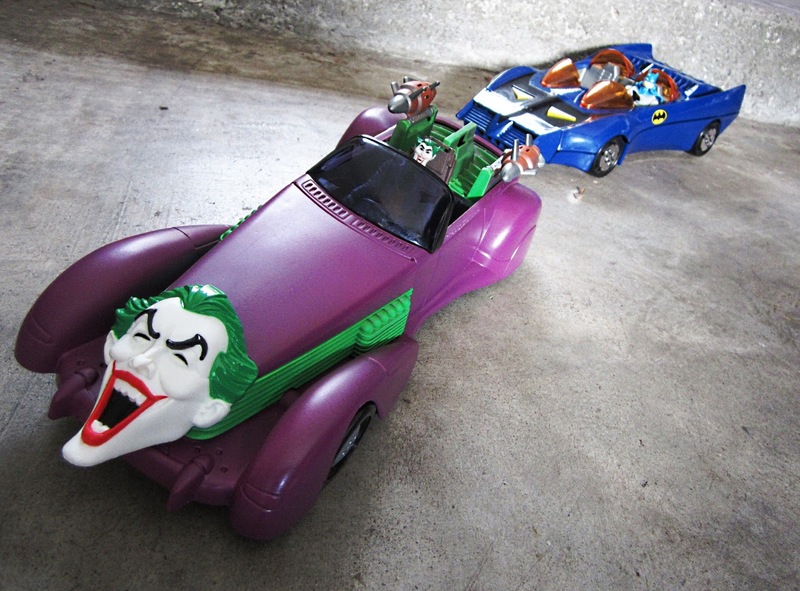 Now, with just a bit of paint and the addition of the joker head hood ornament, you have your very own Jokermobile! These items can still be easily found at reasonable prices. You probably won't be going for mint, however, do try to get a Mirage SX-100 which includes the hood missile. It can be used with the the Joker head to make a working hood ornament missile. 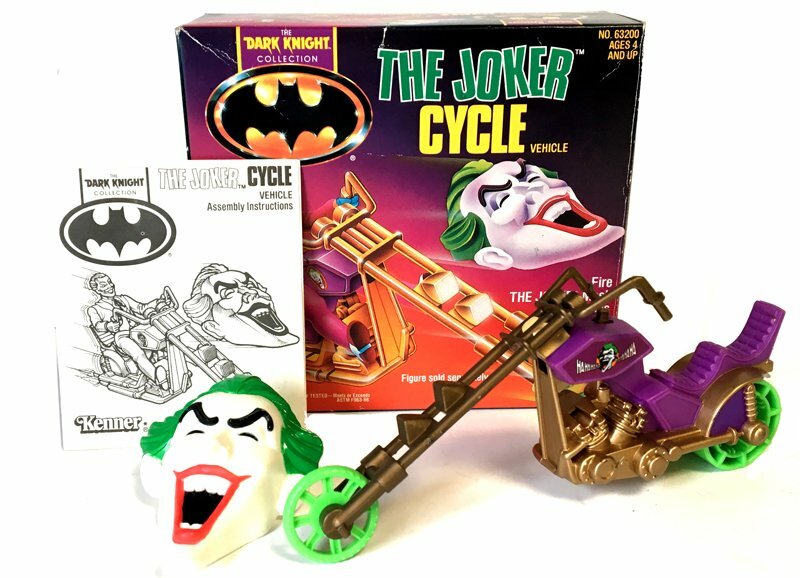 Did you make your own Jokermobile using these or some other plans? Do you have any tips or tricks? Please leave a comment bellow. I don't know, man. That's an expensive kit bash right there. If you're lucky, the planets all align and you don't cross any black cats that day you may spend a cumulative total of $30.00 for both vehicles. But then you gotta get the paint, brushes, etc. That kind of dough gets you mint in the box! I got a joker head by itself for a couple of bucks, 10 bucks got me a lot of fodder in addition to the Shadow car. The Locust seat was $2. So... $10 for parts, Being a modeller, I've already got plenty of paints and brushes, but they do cost so I'll grant you a few cents on brushes an paints... So... $10.50? Not bad, must say. But say you did go all out and spend $30 on minty parts, is that really so bad for a vehicle accessory? Not being a customizer myself, I can say I don't think I would spend that on parts. But, then again you're talking to someone who doesn't have the patience to build Lego's either. So putting my own custom vehicle together certainly wouldn't be money well spent on my end - Regardless of the price. Kudos though. The one you made looks fantastic. Thanks, making this stuff is part of the fun for me, as you can see. There is a cost involved with any hobby, it all depends on how much you are willing to put into it. The bottom line is all about having fun though. If you do, I would love to see it.